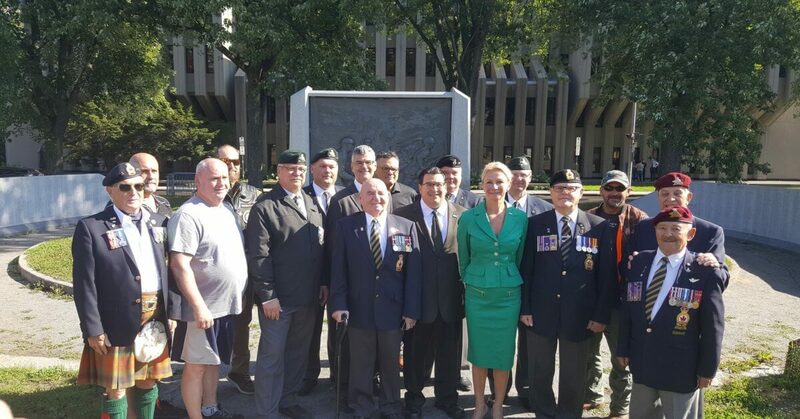 Flanked by CAQ candidates Svetlana Solomykina for Taschereau and Sylvain Lévesque for Chauveau, CAQ MNA and candidate for La Peltrie, Éric Caire, announced today a CAQ government would offer free of charge to veterans wishing to have it a special licence plate bearing the image of a poppy and the word “Veteran”. He was speaking to members of the Royal Canadian Legion. “Much as what is being done everywhere else in Canada and in the United States, we want by this simple gesture to demonstrate to veterans how priceless to our eyes, to Québec and to Canadian society their military engagement is”, Éric Caire stated. The CAQ commitment aims to replace the current veteran licence plate bearing only the poppy and to recognize clearly and distinctively veterans as well as their contribution to Québec society.